college football coach in the country. The ranking is in the magazine’s August college football preview issue. 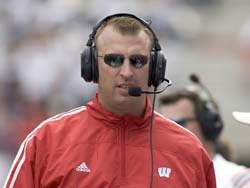 The only Big Ten coach that ranks ahead of Bielema is Urban Meyer of Ohio State. Nick Saban of Alabama is #1, followed by Boise State’s Chris Peterson. LSU’s Les Miles and Oklahoma’s Bob Stoops round out the top five. Pittsburgh’s Paul Chryst, the Badgers former offensive coordinator, ranks 82nd.